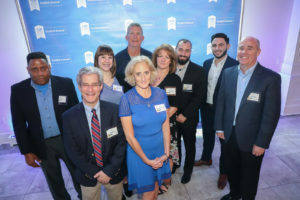 Farmington, Conn., Sept. 25, 2018 – KBE Building Corporation, a $300 million construction services firm located in Farmington and Norwalk, was named one of The Hartford Courant’s Top Workplaces in Connecticut for 2018. The Courant’s 2018 Top Workplaces event was held at the Aqua Turf in Southington, CT on Thursday, September 20. Only 60 companies were named Top Workplaces by The Courant in 2018, chosen from surveys of nearly 14,000 employees at 80+ firms in the state. The winners were named solely based on the survey results, which measured overall employee satisfaction through a confidential, multi-question survey. Surveys were conducted by Energage, a leading research firm on organizational health and employee engagement. KBE was ranked #8 in the survey; this is the second year that KBE has made the coveted list. The firm’s corporate philanthropic program, 50 Ways to Make a Difference, is also frequently cited as a main source of satisfaction by KBE employees. Established in 2009 to celebrate the firm’s new ownership, name change, and 50 years in business, 50 Ways has helped KBE associates donate more than $2.75 million and 13,000 volunteer hours to charitable causes benefiting children, seniors, and military veterans in Connecticut and Maryland. KBE has managed more than $4 billion in construction volume during the past two decades alone and is ranked among Engineering News-Record magazine’s top 400 construction companies nationally. Founded in 1959 and incorporated in 1966, KBE bills $300 million annually. The firm provides preconstruction, construction management, design-build, and general contracting services to clients in the retail, educational, senior living, federal, corporate, hospitality, health care, and institutional markets. KBE’s team of 120+ construction professionals and support staff is deeply committed to the firm’s corporate philanthropy program, 50 Ways to Make a Difference. Established in 2009 to celebrate the firm’s 50 years in business, 50 Ways has helped KBE associates donate more than $2.5 million and 12,000 volunteer hours to charitable causes benefiting children, seniors, and military veterans in Connecticut and Maryland.